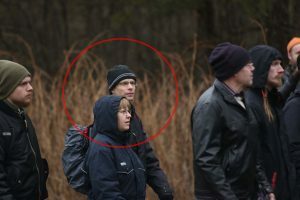 Lisa and Per Hellman have for several years been hiding their nazi sympathies and their membership in the neo-nazi organization Nordic Resistance Movement (NRM). In fear of being exposed and forced to take the consequences of their involvement in the nazi milieu, they have only participated at a few public and internal activities during their years as active in NRM. AFA Stockholm is now revealing Lisa’s and Per’s involvement. The following article has previously been published in Swedish, but since Lisa grew up in Canada, we are now publishing it in English to inform people there. Lisa Hellman (19711129-0883) and Per Hellman (19620103-6032) are active in the local part of NRM called Näste 8 (Nest 8), covering regions the regions west and south of the greater Stockholm region. They have participated in NRM’s public activities since 2016 and their internal meetings since 2018. Shortly after the NRM’s demonstration on May 1st, 2016, Per ordered NRM’s party program “Vår väg” (Our Way) from the organisations former webshop Kampboden. A few days later, Lisa ordered “Mein Kampf“ from the same webshop. In 2017, they ordered nazi literature from the new webshop Midgård. When ordering from the NRM’s webshop they were, like so many other customers, unaware of NRM’s poor data security. The databases from both Kampboden and Midgård leaked and names and information about all the customers are now in the hands of anti-fascists. The couple has participated in three demonstrations with the NRM, the first in Stockholm 2016, see pictures below. Per and Lisa in the NRM demonstration, “Stoppa främlingsinvasionen” (“Stop the invasion of foreigners”), November 12th 2016 in Stockholm. 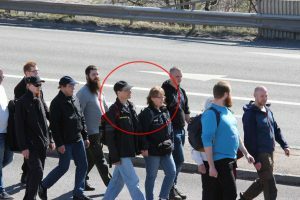 Per and Lisa in the NRM demonstration, “I folkgemenskapens tecken” (“In the sign of Volksgemeinschaft”), May 1st 2017 in Falun. Per and Lisa in the NRM demonstration, ”Vi är inga politiker – vi är folket” (“We are no politicians – we are the people”), May 1st 2018 in Ludvika. Apart from the public NRM demonstrations, the Hellmans has been participating in internal activities, meetings and seminars. In 2018 they participated in the local NRM nest’s national day celebration, consisting of martial arts training, lectures and group meeting. They also participated in the monthly meeting and lecture with the nest in November 2018. Per and Lisa taking part in the 2018 national day celebration with members and hangarounds to the local nest of NRM. Several of the members are identified in an article published by AFA Research in the summer of 2018. Per and Lisa got in touch by mail correspondence in the mid 1980’s through their shared musical interest. Per stayed with Lisa in her hometown of Edmonton, Canada for a few years and after that Lisa came over to Sweden and eventually they moved in together. They have lived in several places together, but since 2011 they are situated in Sannerud, Tived. During the years as active in the nazi movement, the Hellmans has also been active members of their local community in different ways. In fear of being excluded from their local connections, they have kept it a secret that they are active and organized nazis. Apart from being engaged in local matters, they are also members of a spiritual and alternative milieu, which is the subject of the different businesses they are running. As small business owners they are very dependent on the loyalty of their customers and that the customers recommend the products to others. We are certain that the information that Lisa and Per Hellman are nazis will marginalize them. Their nazi involvement will hurt their business and perhaps make it necessary to choose between nazism and a normal life. Lisa and Per are both parts of the board of a local organisation called Tiveds utvecklingsgrupp (Group for the development of Tived). Their nazi activism does not go along well with the purpose of the organisation which is “to work for better solutions to the many local issues relevant in the everyday life of the citizens of Tived. The purpose of the organisation is to work with issues concerning the whole district. The general ambition is to push for a positive development in the Tived region”. 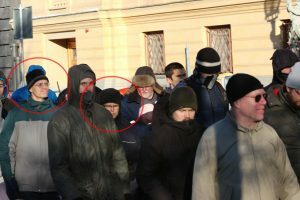 We presume that Per and Lisa will be suspended from further involvement in the development group, since we are certain no one in the area wants to be represented by two organised nazis. The development group has been an important part of their networking process as small business owners. On the homepage of the organisation, a lot of local news, events and happenings are presented and it has worked as a marketing platform for the Hellman couple’s businesses. Hellmans has been able to quite freely update on their own activities. Since 2007, Per is running the publishing company Back to Being. The company is publishing titles in the categories animal rights philosophy, health and spirituality and is also offering translation from English to Swedish, proofreading and editing. Per has a bachelor degree in practical philosophy from the University of Gothenburg. The publishing company is the couple’s main business and is helping to fund their their nazi activity. From now on, all of Per’s businesses will be connected to his nazi involvement even though he claims to be free from all dogma, -isms, as well as other political or religious ideas. The books published by Back to Being are able to order from all main book distributors in Sweden. Contact the companies involved with Back to Being and also the retailers selling their books about Per’s nazi activity. In 2019, Per and Lisa started yet another company called Tiveds Alltjänst where they offer their help as handymen to local customers. Screenshot from the Facebook page of Tiveds Alltjänst. Lisa is running the farm shop Post-Lisas butik in the same house the couple lives in, where she sells books from Back to Being and a number of homegrown products, as well as performing healing, angle massage and mindful tapping in the farm shop. Lisa also uses the facilities of Alternativ Praktik Helheten in Örebro for her practises. Previously, she hired a room in the old school in Tived. Screenshot from the Facebook page of Alternativ Praktik Helheten. Lisa has got one foot in alternative new age-circles and the other in the nazi movement. In the alternative circles ideas of a coming great catastrophe, utopia or return of Messiah, is mixed with a belief in Rudolf Steiner’s thoughts on science, medicine, nutrition and so on. People involved in this movement are trying to become powerful and successful by mastering various spiritual forces and they are looking for the great leader, a guru or savior who will bring enlightenment and answers. The interconnection between the spiritual movement and nazism is well documented historically and the similarities between the two movements are striking. With Lisa, it gets even more obvious by looking closer at her activity on social media. On social media, Lisa is open with sympathies and acquaintances she can’t be public about in her everyday or professional life. There she has contact with several well-known members of the NRM and numerous other documented fascists. Apart from spreading extreme right propaganda, Lisa is posting links about the Bilderberg group, cats protecting against evil spirits, negative energy and healing powers, conspiracy theories about the pharmaceutical industry and so on. 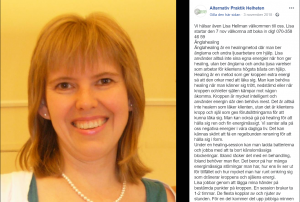 Lisa has a teaching degree and has worked as a teacher and coordinator in Swedish for foreigners in Laxå municipality. Lisa has been commenting anonymously on NRMs homepage Nordfront since 2017 under the pseudonym “Ida” and as Ida she has shared information about her work as teacher in Swedish for foreigners and the municipal adult education. We have made contact with workplaces, business partners, customers, friends and family to inform them about the nazi activity Lisa and Per are involved in. Active nazis will sooner or later end up on our homepage where the information about you is easily accessible to employers, co-workers, landlords, neighbours, friends and family. 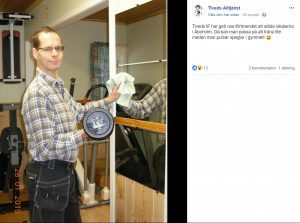 With this article and the previous in Swedish, AFA Stockholm has informed the public about Per and Lisa Hellman’s activity in the fascist movement. Do you know them personally or through work or your everyday life? Do you have other information about fascist activity in the greater Stockholm region? Don’t hesitate to contact us!